Bad credit will follow you around no matter where you go. It affects your ability to buy a house and a car, or get a credit card. Bad credit can even have a negative impact on your employment opportunities. Bad credit is a dark cloud which can seem impossible to shake. But clear skies can soon be yours again with Sky Blue Credit. Sky Blue has over 24 years of experience and a reputation for honesty. Credit repair agencies can sometimes have a questionable reputation, but Sky Blue has always been in full compliance with all applicable laws, and has the highest rating from the Better Business Bureau. Sky Blue will analyze your credit reports and help you eliminate as many negative items as possible. Credit law is complicated, and unless you’re an expert, you’re probably not going to have much success repairing your credit. Sky Blue will do the work for you. They’ll determine which negative items can be cleared, and how to best do so. Sky Blue will send personal letters of dispute out, and follow up with them diligently. A large part of credit law requires written communication between parties to take place within a certain number of days. It can be hard for an individual to keep track of all of this, but with Sky Blue you get a dedicated team of professionals. What Does Sky Blue Credit Cost? Sky Blue has a $59 setup fee and a $59 monthly fee. The monthly fee begins the second month. Work is never billed in advance, in strict compliance of the law. Most clients typically only need the service for a few months in order to see significant improvements to their credit score. Sky Blue also offers a “couple discount” – if you’re already enrolled, your significant other can get a 50% discount on the monthly fee if he or she also enrolls. Sky Blue will keep your informed every step of the way. Some negative items on your report are worth pursuing, while others are not. The experts at Sky Blue will give you advice, but ultimately follow whatever course of action you want. Of course, you’re probably not an expert on credit reports, and that’s okay. Sky Blue is here to explain every potential course of action. A negative report on your credit can have a huge effect on your life. Removing a negative item from your credit report is a complicated procedure with rules and deadlines that can take years to learn on your own. Your best bet to improve your credit is to hire a credit repair agency. Unfortunately, thanks to some unscrupulous actions by other repair agencies in the past, it can be hard to determine which credit repair agencies you can trust today. 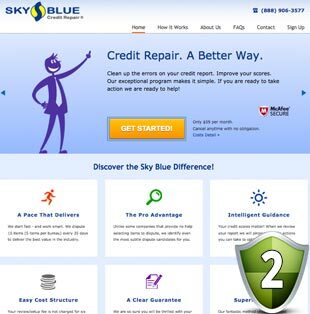 Since 1989, Sky Blue has been a reputable, honest and effective leader in the credit repair industry. Thank you for reading our Sky Blue Credit Reviews. If you don’t know what to expect from Sky Blue Credit, you should contact this company on the phone and ask them for help. You will soon be able to see that they are able to do more than help. They are able to jump in, head first, and give you a strategy to repair your credit. I liked my experience with Sky Blue Credit. From beginning to end, no matter the detail, they were able to help me. This is what I was looking for, and that is why I got. Thanks again to Sky Blue Credit for repairing my credit. Regardless of how low your credit score may be, Sky Blue Credit can help. Trust me, I was down into the 500’s when I contacted them, and now things are looking up as my score is up about 100 points. Do you feel that your credit score is dead forever? Call Sky Blue Credit and they will tell you that this is not the case. They will show you that repairing your credit is possible, no matter how bad things may appear. Like most grandparents, I want to spoil my grand kids any chance I can get. Unfortunately, my paycheck doesn’t allow me to spoil them as much as I’d like. But when Christmas came around and money was stretched tighter than usual, I knew I had to do something to make my grand babies holiday special. I came across sky blue credit when researching payday loan companies online. They had the fastest approval times, the quickest money transfer times, and the nicest customer service folks. After they approved my loan, I went shopping and was able to spoil my grandchildren like a grandma should! What a wonderful service! At first, I had a million excuses why a payday loan service wouldn’t work for me. I thought they were just for desperate people in emergency situations. A friend of mine showed me that I was mistaken. He had secured a payday loan to make the deposit on getting a new roof for his house. It wasn’t an urgent matter, but it was something he knew he’d have to get replaced sooner or later. Less than a month after that, I noticed the roof of my own house was looking a little shoddy. My friend gave me the information for Sky Blue Credit, and I contacted them right away. They were so friendly to deal with, and they helped me work out a loan amount and payment terms that suited my situation. I called my roofer, put down the deposit, and had work started on the house. Over the next few weeks, I paid back my loan without putting myself into some awful financial hardship. It was all so manageable and easy. I now recommend Sky Blue Credit to all my friends. They have the best interest rates around, and their fees are more than reasonable. What a comfort to have the support of a company like Sky Blue Credit! Without going into the nitty-gritty details, I needed a lot of money right away. Sky Blue Credit was able to give me more cash than any of the other payday loan companies I looked into. And they didn’t charge me an arm and leg in interest and fees. The entire shebang was so smooth and simple. I had the money I needed in less than 24 hours! If you need money fast, Sky Blue Credit is the place to go. These are the only people I would trust with my financial needs, and I am so relieved to have found them. Grazie, Sky Blue Credit! My strategy for repairing my credit was to simply wait. Sky Blue Credit told me that there were other things I could be doing, and it was not long before I had a strategy that worked.